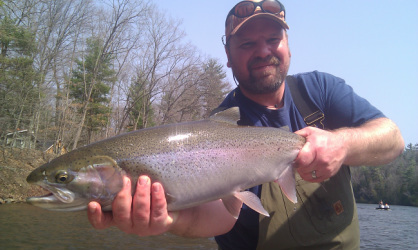 A native to the west Michigan waters, Luke brings over 10 years of river guiding experience to Hulst Outfitters. After taking a few years off from guiding to explore other interests and fish every body of water bigger than a mud puddle, Luke is coming back to share his broad fishing knowledge with guests again. Customers will enjoy not only his knowledge but his personality as well. Luke is hands down one of my favorite people to fish with, and I am confident that you will enjoy his larger than life personality as well. While float fishing is his passion, Luke excels at fly fishing, and most other forms of angling.